Vitamin C ain't yellow, but it's not as black-and-white as it is portrayed on social media, these days. A couple of years ago, the #1 discussions about vitamin C one could have would usually address the following questions: "Does vitamin C prevent/treat the common cold?" and... (I still get this question, by the way) "Is ascorbic acid/manmade vitamin C bad for your health?" Don't worry, neither of these questions is going to be re-addressed in this short C-special (for the latter question, I suggest you re-read my article about 'natural' vs. 'synthetic' vitamins, here. Will ALA, Berberine & Co Ruin 'Ur Gainz? What I cannot spare you, though, is the question of anti-hormetic effects, which is contemporarily the most heavily-debated C-question. Basically, the theory of (mito-)hormesis says that some 'stress' (in the form of radical oxygen specimen | ROS) is necessary for our mitochondria to work properly, to adapt, and renew. Accordingly, it's not really surprising that bad things will happen if you drown all ROS in vitamin C (+E)... bad things, of which the worst (for the bros, at least) may actually be that ascorbic acid blunts the adaptational response to exercise. Yeah, thAt's bad news! What's actually worse, though, is that the C+E combo has also been shown to mess with the exercise-induced improvements in glucose management in people for whom their life, not their athletic career and/or their personal vanity are at stake. It does, therefore, make perfect sense to think twice about the potential side effects and benefits of supplemental vitamin C. I mean, as pointed out in a previous article, vitamin C can also help improve/restore the very same glucose handling it appears to mess with when it blunts the exercise-induced ROS increase. Take your yearly serving of vitamin C research early! 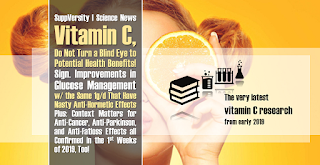 Starting with a very recent study (Feb 2019) about ascorbic acid's beneficial effects on sedentary T2DM patients, this article is going to give you an overview of selected studies from 2019 (seasoned with older studies as references) to bring you up to speed with everything that's new and interesting in the world of vitamin C research, including its use(fullness) in battling Parkinson's, its Janus-faced role in our battle against cancer, its liver-protective effects in people on antibiotics, its association with reduced risks of chronic respiratory disease, and - obviously - the latest revelations about its anti-gains + anti.-fatloss effects in exercising young women... and the answer to the question "What is worse, vitamin C or vitamin E?" Vitamin C, not so bad as its anti-hormetic effects suggest: #T2DM patients see potentially clinically significant health-improvements - From previous SuppVersity articles you already know that taking a binary black-and-white perspective on ascorbic acid (vitamin C | AA) is unwise. 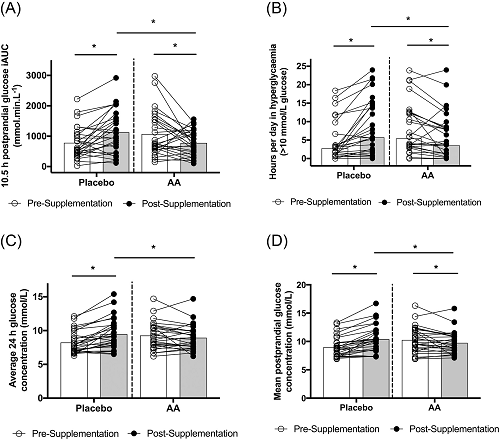 With its anti-hormetic effects, AA may block the adaptational response to exercise (see "Vitamin C + E Blunt Your Gains" | more), on the other hand, a recent study by scientists from the Deakin University in Australia (Mason 2019) is not the first one to report beneficial effects on glucose metabolism - especially when the latter is already compromised (cf. 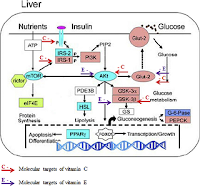 "Vitamin C and glucose management" | more). In the corresponding experiment, Shaun A. Mason et al. found that "ascorbic acid supplementation improves postprandial glycaemic control and blood pressure in individuals with type 2 diabetes" (Mason 2019). For their RCT, the authors recruited N=31 individuals with type 2 diabetes (26 males and 5 females; aged 61.8 ± 6.8 years; duration of diabetes, 5.6 ± 4.6 years; HbA1c, 7.6% ± 0.7% [mean ± SD]) for a randomized cross‐over trial (RCT) involving 4 months of supplementation with oral AA (2 × 500 mg/d) or placebo. As previously hinted at, this dosage of 1,000 mg/day of vitamin C, when combined with 400 IU of alpha-tocopherol (vitamin E), has been shown to blunt the glucose sensitizing effects of exercise (Nikolaidis 2012). as well as rather unexpectedly large reductions in systolic (−7 mm Hg) and diastolic (−5 mm Hg) blood pressures and a specific fraction of free plasma F2‐isoprostanes (−47 pg/mL | marker of fatty acid peroxidation) vs. PLA. Important: While the cardiovascular health markers benefit, body composition, weight, and, in the "physique-context" most importantly, body fat levels were not affected by the provision of 2x500mg/d vitamin C.
Overall, the Mason study is thus extremely good news, because it suggests cardio-metabolic benefits that could add significantly to the health-span of type II diabetics... we must not forget, however, Nikolaidis' conclusion from their 2012 paper which dealt with studies in normal, active individuals and read: "[A] permanent intake of non-physiological dosages of vitamin C and/or E cannot be recommended to healthy, exercising individuals" (Nikolaidis 2012). 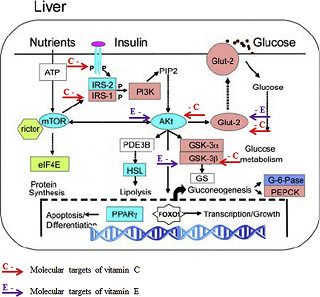 Graphical abstract of the results of a recent rodent study that suggests that the combination of vitamin C and E may be so detrimental because the two mess w/ your liver's glucose metabolism via different (synergistic) processes (Ali 2018). Ok, is it vitamin C or vitamin E that's the problem? The simple answer to this question is both! In fact, Egyptian scientists (Ali 2018) have proven only recently that chronic (8 months) supplementation of high doses of both ROS-scavengers will lead to (a) the "disrupt[ion of] glucose tolerance by attenuating upstream hepatic insulin action through impairing the phosphorylation and activation of insulin receptor and its subsequent substrates" for high-dose vitamin C and (b) "effect downstream insulin receptor in the insulin signaling pathway, reducing hepatic glucose transporter-2 (GLUT2) and phosphorylated protein kinase (p-Akt)" for high-dose vitamin E, respectively. As the scientists from the Pharos University in Egypt point out, [o]verall, these findings indicate that the conventional view that vitamins promote health benefits and delay chronic illnesses and aging should be modified or applied with caution" (Ali 2018). ... Parkinson's disease: In a fly study that's available as a free full-text on PubMed, scientists demonstrated that - just as with almost every supplement - high-dose chronic supplementation w/ the same compound that will show clinically relevant benefits if it's used correctly can have unwanted and contradictory effects on certain disease states - For Man Anh and colleagues this was Parkinson's disease, which seems to improve initially, only to be corroborated by psychological problems when the lab animals are (fig.) bathed in vitamin C (Man Anh 2019). ... cancer and 'oxidized vitamin C': Also worth mentioning in the context of the nasty effect vs. side effect conundrum is that the often-described anti-cancer effects of vitamin C have recently been linked to Dehydroascorbic acid (DHA), the oxidized (previously considered used/useless) form of ascorbic acid, of which Ye et al. write that "[it] could be a novel treatment strategy for NSCLC [on-small cell lung cancer] with acquired resistance to targeted therapy" (Ye 2019). At the same time, I must warn you, though: There's also evidence of vitamin C and other anti-oxidants' ability to interfere with the cancer-killing effects of classic chemotherapy (Khurana 2018). And finally, research by scientists from Poland seems to support the notion that - in view of the generally cell-protective effects vitamin C - the provision of DHA instead of intact vitamin C could be a viable anti-cancer strategy, as this already oxidized form of ascorbic acid is "preferential [taken up] by cancer cells with the subsequent depletion of critical cellular reducers as a result of ascorbate formation" (Blasczak 2019). ... liver-protective effects when you are 'on' antibiotics: The liver is the #1 organ when it comes to your metabolic health - it's even more important than muscle! The latest research from the AIMS Health Science Campus in India suggests that at least really high doses of vitamin C (3g/day as supplement + food sources) could be your go-to adjunct to antibiotic treatment because it seems to "put down the risk of liver toxicity" (Simon 2019) significantly. The study was yet done in vitro, on liver slices and warrants confirmation in real clinical trials. ... chronic respiratory disease and mortality: While the beneficial effects of vitamin C supplements on your risk of the common cold are still highly debated (and at best very small), the results of the analysis of data from N=19,357 men and women aged 40-79 years without prevalent respiratory diseases at the baseline (1993-1997) and participating in the European Prospective Investigation into Cancer (EPIC)-Norfolk study suggests have significantly reduced risks for several chronic respiratory diseases, including a 43% lower risk of lung cancer (hazard ratio (HR) 0.57; 95% confidence interval (CI): 0.41-0.81) and a 15-30% reduced risk in various non-cancerous respiratory diseases, if they had high vs. low serum vitamin C levels. 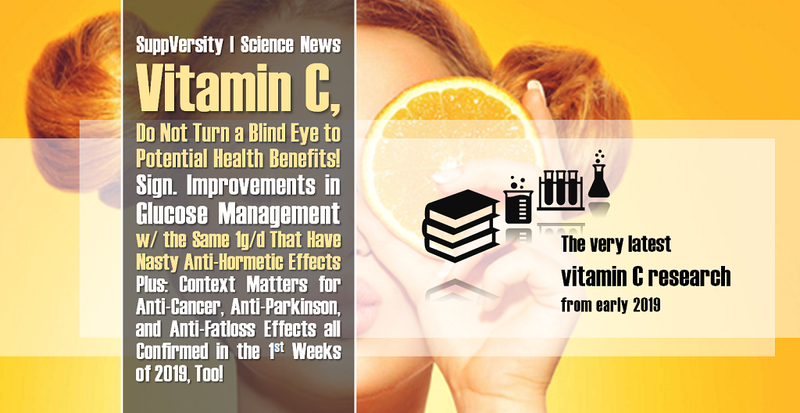 In this context, it is worth, if not necessary, to point out that the scientists attribute these benefits to vitamin C's role as a "marker of high fruit and vegetable consumption" - eventually it's thus fruits and veggies that are probably responsible for the effect the scientists observed in their study from January 2019 (Myint 2019). 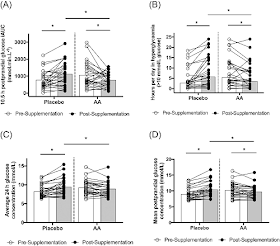 ... the presence of anti-hormetic effects in athletic young women: As hinted at earlier, the ability of a stack of 1g of vitamin C + E to blunt the positive metabolic response to exercise in young an old(er) men has been well-established. Now, a recent study (Dutra 2019) observed similarly detrimental effects in resistance training young women. Figure 2: %- change in fat-free mass (FFM) + fat mass (FM) from pre (wk 0) to post-training (wk 12 | mean ± SD) in the training + vitamins, training alone and the sedentary control (Dutra et al. 2019). As you can see in Figure 2, the changes in body composition the scientists saw in response to the antioxidants were visibly reduced when the subjects, young healthy, exercise-trained women, supplemented with three pills containing 3x330mg and 3x133IU of vitamin C and E (total 1g/d + 400IU/d) over the course of the 10 weeks strength training program (intensity progression included; lower leg focus). Putting things into perspective: Aside from T2DM as in the Mason study or other chronic diseases, baseline inflammation, age, vitamin C status (and how the latter changes over the supplementation period), weight/body fat, amount and intensity of exercise, etc. ... etc. are all important co-variables you have to consider if you want to decide if you should or shouldn't take high dose ascorbic acid supplements. What can be said generally, though, is that the (comparatively) small quantities from foods, are simply too low to have anything but positive effects - whether and to which extent that's also related to co-factors has been addressed in this previous article about "natural vs. synthetic vitamins" (read it). Results of a high antioxidant diet + exercise intervention study from late 2018 seem to confirm: Not dietary vs. supplemental and type of antioxidant seem to matter. 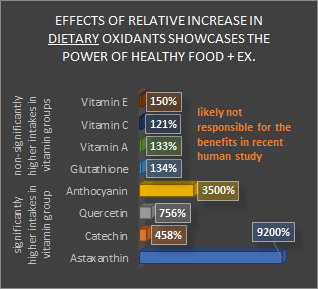 It's also worth mentioning in this context that it seems that not all antioxidants are created equal(ly harmful): While classic ROS scavengers like vitamin C + E or NAC have an ever-increasing number of studies to back up their anti-hormetic effects, the results of studies w/ catechins (e.g. EGCG), astaxanthin, quercetin, glutathione, anthocyanin, or curcumin are mixed, many show benefits even for athletes. Especially if they're consumed in form of food, these "antioxidants" (some, like EGCG, act through pro-oxidative effects that can be a problem when you overdose) will augment, not inhibit the exercise-induced improvements in glucose management researchers report in a late 2018 article in untrained male subjects (Takami 2018). In the corresponding RCT by Takami et al., the natural (directly from foods) antioxidant cocktail augmented the beneficial effects of cycle training at 60% maximum oxygen consumption for 30 min (3 days per week for 4 weeks) on glucose control in untrained men significantly. What I consider important to note, though, is that there was no significant difference in vitamin C + E intake between the vitamin and control group (see Figure 3). With Takami's study being only the latest in a long line of studies, it should be clear that there's still a lot of research to be done on who, when, and why people benefit from which types, forms, and sources of antioxidants, as well as the amount and duration that are required for corresponding pills and powders to put you at risk of reducing your 'stress levels' to anti-hormetically low levels of ROS (Pesta & Roden 2017) | Comment on Facebook! Blaszczak, Wiktoria, et al. "Vitamin C as a Modulator of the Response to Cancer Therapy." Molecules 24.3 (2019): 453. Khurana, Rajneet Kaur, et al. "Administration of antioxidants in cancer: debate of the decade." Drug discovery today 23.4 (2018): 763-770. Man Ahn, et al. "Evaluating Dose- and Time-Dependent Effects of Vitamin C Treatment on a Parkinson's Disease Fly Model." Parkinsons Dis. 2019 Jan 2;2019:9720546. Mason SA, Rasmussen B, van Loon LJC, Salmon J, Wadley GD. Ascorbic acid supplementation improves postprandial glycaemic control and blood pressure in individuals with type 2 diabetes: Findings of a randomized cross‐over trial. Diabetes Obes Metab. 21 (2019):674–682. Myint, Phyo Kyaw, et al. "Plasma vitamin C concentrations and risk of incident respiratory diseases and mortality in the European Prospective Investigation into Cancer-Norfolk population-based cohort study." European Journal of Clinical Nutrition (2019): 1. Nikolaidis, Michalis G., et al. "Does vitamin C and E supplementation impair the favorable adaptations of regular exercise?." Oxidative medicine and cellular longevity 2012 (2012). Pesta, Dominik, and Michael Roden. "The Janus head of oxidative stress in metabolic diseases and during physical exercise." Current diabetes reports 17.6 (2017): 41. Simon, et al. "In vitro protective effect of ascorbic acid against antibiotic-induced hepatotoxicity." Curr Drug Discov Technol. 2019 Feb 4. Ye, et al. 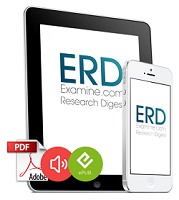 "Oxidized Vitamin C (DHA) Overcomes Resistance to EGFR-targeted Therapy of Lung Cancer through Disturbing Energy Homeostasis." J Cancer. 2019 Jan 1;10(3):757-764.